So, inspired by all the Navratri spirit around me, I decided to clean out the living room cupboard, Mi. Remember how, when we first moved into this house, it was half decorative stuff and half toys? Then gradually, over the years, two shelves were taken over by books. We replaced those with your books. All so nicely covered in white. And then, as the days passed, we used the cupboard as a repository for everything that didn’t fit elsewhere. It is a good thing only the top half is glass and the rest of it is a regular wooden door. I had such a wonderful time cleaning it. At first I was a bit intimidated, you know. Even though it looks like a smallish cupboard, it isn’t. It took me almost all day to sort it out. I first emptied it completely, cleaned it, put some freshener cubes inside and then, arranged some of the stuff back in. And of course, once I got to the books, I had to settle down on the sofa, taking a break only during lunch time. Do you know I found pages from your 1968 diary, Mi? What a lovely handwriting you have! And I found all kinds of information snippets—quotes by you, general knowledge stuff and so forth. There were notebooks in which both of us have written things—poems, tips, limericks. I simply tumbled into nostalgia world. Of course there was a lot of Vidur’s scribbling—so delightful to go back and relive those moments. You know, there are 100 days left this year. I really wanted to do something significant, Mi. So after much pondering, I thought I’d write about one thing every day, that’s part of our home, and the memories associated with it. And perhaps some declutter news. For today, I picked this cute Kali. I restored her to her former glory by mending her, patching her and repainting her. Doesn’t she look gorgeous? I used different colors to paint her this time to make it more striking. I now have her chilling on my desk. Although, I think I’ll place her back in the puja room. Remember when we got her? Vidur used to drive me crazy insisting on playing with the doll and I’d be constantly worried he would damage her. Well, much to your amusement my fear came true when he dismantled her from her pedestal. Then I was so mad. 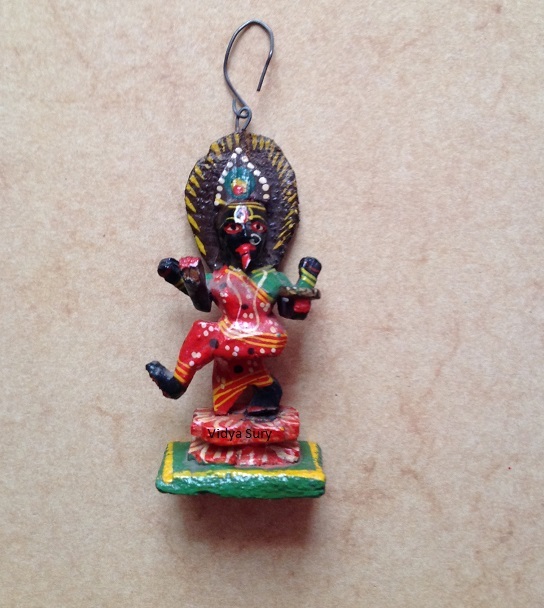 Finally, I put a hook on the top and kept her in the puja room. Reminded me of how he implored us to keep bommai kolu and then would insist on playing with all the dolls every day. Sure he enjoyed the prasadam and sundal…and you said: what the big idea of a festival if the child in the house can’t be happy. Ah well, he was three years old and not really old enough to understand a lot of things like tradition. He prayed a lot and I guess all that good karma is standing him in good stead today. I will be back tomorrow with something else I am doing, Mi. Missing you through the process and the endless cups of coffee! 100 days left in the year.